The last week has been a whirlwind of stress and emotion for me. I knew I wanted Fall For Me to be up and live on Amazon with enough time before the tour starts to actually have buy links active. There would be nothing worse than trying to promote a novel that doesn’t actually exist. What I didn’t know was how long my novel would take to become live after I hit the publish button. I now know that for Kindle it was a matter of hours. For the paperback edition, it was a little longer. Through this process I’ve learnt a few things that I thought I’d share with you, so hopefully those of you who want to travel the indie route might not make the same mistakes. Although, some things I probably wouldn’t really call a mistake, more of a misinformed decision. Firstly, I’ll start with the eBook formatting. I actually typeset my print book first. Because I’m a graphic designer I did this myself, and I actually wanted a printed proof in my hands to sit down and read through, and get others to read, before I made my corrections. I find it much easier to do the proofing stage on paper than on screen. Once it was typeset, Fall For Me actually went through four home printed proofs and two CreateSpace proofs before I finally approved it. And I bet there are still some things I’m not entirely happy with, but there comes a point when you need to let it go. Anyway, back to the eBook formatting. This is what I did, and what ended up working for me. If you have any other tips, I’d love to hear them. First, I copied the entire text from my design document and pasted it into Word. I was hoping that all my formatting would be retained because I didn’t fancy the thought of having to go through hundreds of pages and reapply italics. Luckily it did, but I needed to make a few adjustments before I could call it ‘formatted’. Next, I went through and checked my styles that had been imported from InDesign. 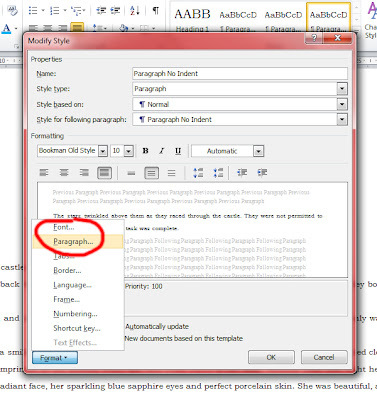 You can just use the styles already in Word, but any styles that you create or import need to be based on Word’s Normal style. I’ll tell you why later. Right click on your style either in the quick styles or the styles list and a dialogue box appears. If you look at the image below, I have a style called Paragraph No Indent that is based on the style Normal. I needed to make sure the style was doing what I wanted it to, so I adjusted the Font and Paragraph sections in the menu down the bottom of the same dialogue box. This will automatically update all test in your documnet that has the style applied to it. I set my font to Bookman Old Style at 10pt. You can use whatever you want. I would pick something simple though as Kindle changes the fonts anyway, and the user also has a choice between a few different ones depending on their device. 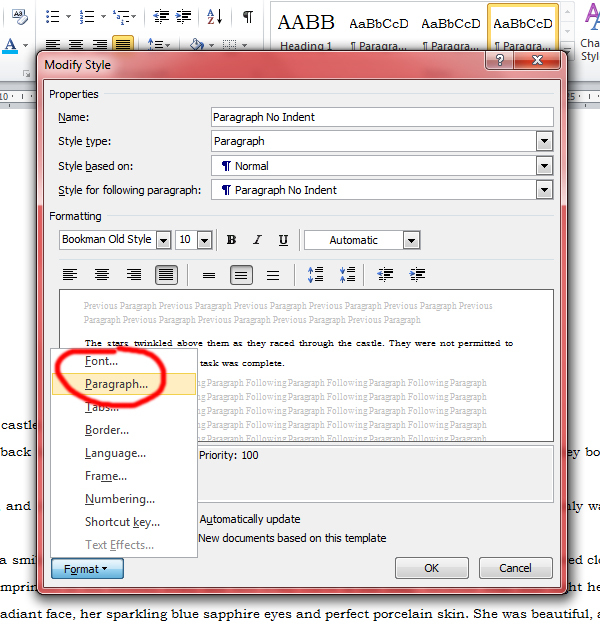 The paragraph is set to 1.5 line spacing with no space after paragraphs and no indent. I used this style for all the first paragraphs in my chapters. I then did the same for my Paragraph Indent style for the rest of my book copy, only the indent is set to 1cm. Now back to my indent problem. Kindle automatically does this thing where any paragraph that doesn’t have an indent applied, it gives it one. I was pulling my hair out trying to find out why all my first paragraphs were indenting when I had no indent applied. It’s because Kindle want to create the best user experience possible, but nowhere in Amazon’s Building Your Book For Kindle did it say this was the case. But maybe it did and I missed it, which is quite possible. 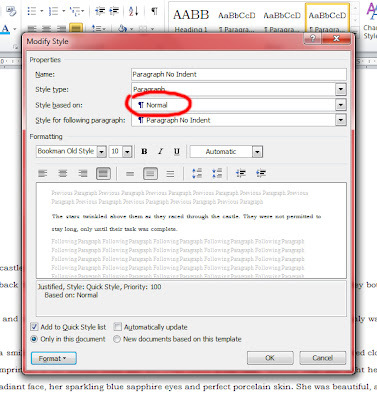 This is the solution I used: Remember how I said to base your styles on Word’s Normal style? Well, I then went into that style and modified it to match my other paragraph styles in every way concerning font, line spacing etc. The only change I made was to make the paragraph indent a tiny 0.03cm. It now has an indent that is so small it can’t be seen, and it will override Kindle’s annoying automatic indent. Once I figured out how to fix my indent problem, I ended up with a nicely formatted eBook. At least, I hope I have. I checked it on the previewer and my iPad, and all seems fine. The last tip I wanted to share with you is for those who decide to go with a white cover for your eBook. I love my white cover. The print book looks so pretty, but for a while I was cursing it because on-line a lot of sites are also white. I eventually came up with a solution. To differentiate the cover from Amazon’s white background, I needed a rule around the image. KDP suggests uploading a full size cover image of 2500 pixels on the longest side for best results across all sizes, but I found when it was reduced to the tiny size that's in the search results, half of the black rule around the image was disappearing. I tried a couple of things and ended up doing this: I put and extra little bit of white space around the entire image so the black rule sat in from the edge of the file. It took a few goes to get the amount of white space just right so all the rule would show around the edge of the entire cover - extremely frustrating to say the least. I’d love to hear what other indie authors have experienced with formatting their eBooks. Do you pay someone, or do it yourself, and what problems have you come across? My next challenge: formatting for Smashwords. Their guide is a lot longer than the one for KDP.